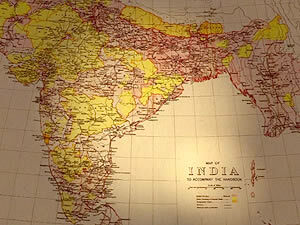 This last episode tells how a foreign multinational (the East India Company) thousands of miles away gradually and almost by chance took power over great swathes of the Indian subcontinent; how after the horrendous shock of the 1857 "Mutiny" the British state took over and turned this supremacy into the Raj, the jewel in the crown of the greatest empire the world had ever seen; and how the Freedom Movement delivered Independence to India in 1947, albeit a divided India. The series ends by acknowledging the extraordinary achievements of Indian democracy over sixty years and flags India's predicted rise to be the largest country and the second largest (or even the largest) economy in the world in the next three decades. Our last episode takes us from the 11 miles of archives of the East India Company in the British Library in London, out to the Hooghly River and 18th century Calcutta (Kolkata), through the battlefields of Lucknow and Etawah in the First War of Independence in 1857 ("The Indian Mutiny" as the British saw it!). At a destroyed fort still marked by cannon fire, we meet the descendent of a rebel Maharaja who tells us how his ancestors fought the British twice – once in 1857 and then during the nationalist movement of the early 20th Century. We chart the development of the Indian National Congress of Nehru and Gandhi and its unlikely founder member - a British civil servant called AO Hume. The Rebel in the Raj, Hume was a recent question in the Indian version of Who Wants to be a Millionaire? The show looks at the rise of newspapers and education in Victorian India, goes to Kipling’s Allahabad and visits the amazing labyrinth of stacks in the National Archive in Delhi to look at the early British censuses. Then Wood takes us on to the First War, the Amritsar Massacre of 1919, the move to Independence and the fateful Partition of 1947, one of the most crucial events in the history of modern India. In Amritsar he meets an 82-year-old Sikh man who tells us of his flight from his village in Pakistan and we cross today’s border to meet his old Muslim neighbours who stayed behind in the Punjab in the same village. The last section of this epic journey "over ten thousand years and ten thousand miles" as Wood puts it, looks briefly at the first 45 years of socialist influenced planning and the last 15 of unfettered growth as India rises rapidly to become a world power once again. Our journey ends overlooking the seven ancient cities of Delhi. We have seen in this epic journey, how over immense vistas of time and often cataclysmic historical events, India has been shaped and sustained by the incredibly deep-rooted equilibrium of its past. But do the ideas of the Buddha, Ashoka, Akbar, Gandhi and the rest still have lessons for India and the world today? On that question may depend not only India’s future, but that of the rest of us too.